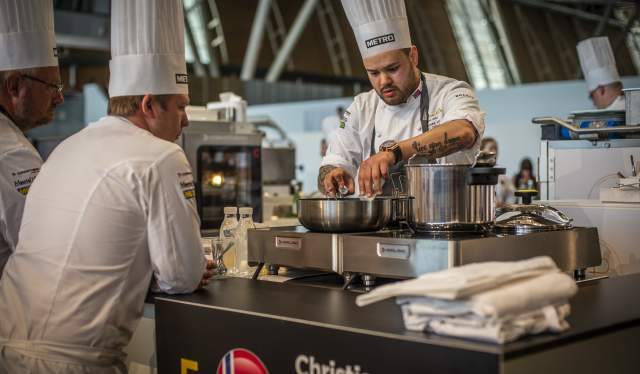 A native of Bodø, Norway, Christian André Pettersen celebrated his top spot on the podium in the Bocuse d’Or Europa culinary competition. “I’m feeling a huge sense of relief. But it’s surreal, and it all hasn’t really hit me yet, that I have won and did so with a good margin,” says Christian André Pettersen to Visit Norway. During two hectic days, 20 nations have competed for ten spots in the world championship finals in Lyon, which will be held in January 2019. Norway achieved the highest score for their “theme on a plate” and “theme on a platter”, which was called “Arctic Spring” and was inspired by the Nordic, Arctic spring and the region’s midnight sun. Ultimately, a total of 108 points separated 2nd place Sweden from the winner. The Danes secured a 3rd place finish, just five points behind Sweden, thereby ensuring an all-Nordic award ceremony at the European finals in Torino. Nothing is left to chance at the start of the world’s most prestigious culinary competition. “We’ve been practising since January, day in and day out. The past month was spent working on details, precision and timing, 12-15 hours per day and seven days a week,” says Pettersen. It’s all about finishing within the same time you have practised on and constantly being aware of what you need to do during the next ten steps in the process. If your rhythm gets messed up, everything is thrown off. 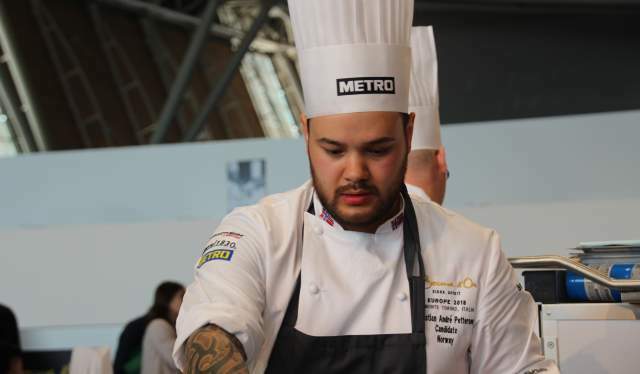 “Everything went pretty much as planned, except for the Italian eggs have a somewhat different consistency than those we used during our practise,” he says. You must also be prepared to receive tremendous support from the audience. “There was a huge group of Norwegian fans cheering in the hall, and the noise level was said to have been measured at over 100 decibels in the stands. We had to learn the timing and steps by heart because we couldn’t hear a word of what we were saying to each other, even from just one metre away,” he chuckles. There will now be a day of rest before Pettersen starts planning for the world championship finals. In order to win again, he must remain true to the concept and continue to work intensively with taste, feelings, harmony, details and visualisation. “No less importantly, I must have a unique team around me such as I have had now,” says Pettersen. In addition to Christian André Pettersen, Team Norway consists of assistant, Håvard André Josdal Østebø, and coach Gunnar Hvarnes. Hvarnes was himself winner of the bronze medal at the world championship finals of the Bocuse d’Or in 2011. Bent Stiansen is the team’s president, as well as one of the competition’s 20 judges. In 1993 Stiansen became the first Scandinavian to win the Bocuse d&apos;Or world championship, and he currently operates the Michelin-acclaimed restaurant, Statholdergaarden, in Oslo. Stiansen’s gold medal turned out to be just the beginning of Norwegian success in the competition. Norway’s Bocuse chefs have won five gold medals, three silver medals and two bronze medals in the world championship finals since 1987. 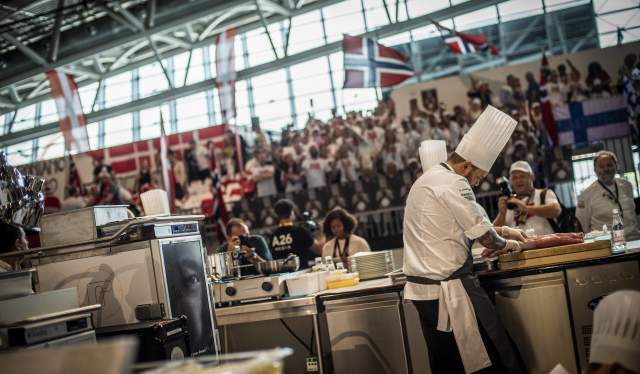 “The fact that we perform well in these competitions strengthens Norway’s position, among chefs as well as within the culinary media landscape and people who are interested in food – and there are very many of them. The competition highlights the profession in an important way while also promoting interest in Norway as a travel destination for foodies. The Bocuse d’Or team in Norway works hard at ensuring that we will also maintain a strong position in the competition in the future,” says Pettersen. “They certainly contribute to helping me win. In Norway you can experience all four seasons in one day, and this makes the raw materials from Northern Norway, and Norway as a whole, robust and unique,” he says. In other words, Norway is undoubtedly a country to reckon with when it comes to food and drink. Not only can you enjoy magnificent Michelin-acclaimed meals today at Oslo-based restaurants such as Maaemo, Galt, Statholdergaarden and Kontrast or RE-NAA and Sabi Omakase in Stavanger – a culinary revolution has taken place across the entire country. Quality raw materials produced by committed and proud suppliers allow you to taste pure Norwegian goodness from the sea to the mountains, which are professionally prepared by dedicated chefs who do their utmost to ensure that you will partake in an unforgettable meal. Inspired by the Norwegian Arctic spring and the return of the midnight sun; Both elements in creating divine taste and a vibrant season feel.